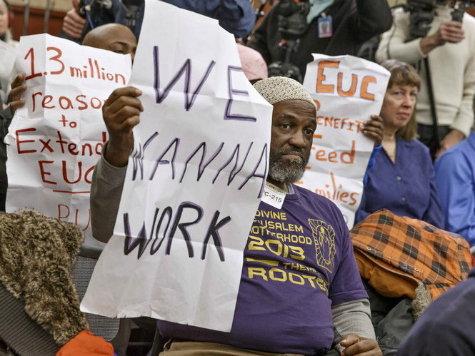 U.S. economic conditions in 2014 continue to languish, as millions of Americans remain jobless. Seven economic facts underscore America’s increasingly dire economic outlook. The latest Labor Department figures reveal that a record 91.8 million Americans are no longer in the U.S. labor force. To be included in the Labor Department’s calculations for this statistic, a person must be 16 years or older, a civilian, not in an institution (such as prison), and someone who has not looked for a job in the last four weeks. According to the U.S. Census, 317 million people live in the United States. The number of working age Americans that do not have a job has increased by nearly 10 million since Barack Obama first entered the White House. In January 2009, the number of “officially unemployed” workers plus the number of Americans “not in the labor force” was sitting at a grand total of 92.6 million. Today, that number has risen to 102.2 million. That means that the number of working age Americans that are not working has grown by close to 10 million since Barack Obama first took office. The Department of Agriculture, which oversees the food stamp program, says that 47,415,895 Americans – roughly one out of every six Americans – now receives food stamps. Indeed, for the last fifteen consecutive months, the number of individuals has consistently stayed above 47 million, a first in U.S. history. Food stamp enrollments, which are considered an indicator of economic distress, have skyrocketed in recent years as the Obama administration has loosened eligibility requirements and aggressively promoted enrollments. In January 2009, 31.9 million people received food stamps. Social Security data reveal that a record 10,988,269 Americans now receive a monthly check for an average $1,146.43. Several recent studies and investigations have revealed that the nation’s disability program is rife with fraud and abuse. When health care for disabled workers is included, U.S. taxpayers now spend $260 billion a year funding the disability program – a figure that exceeds the amount spent on food stamps and welfare combined. A new Census Bureau report released last week found that 31.6% of Americans fell beneath the federal poverty line for at least two months between 2009 to 2011, a 4.5% increase over the 2005 to 2007 period. Gallup on Wednesday released its latest “Mood of the Nation” poll that found that 42% of Americans say they are worse off financially than they were a year ago, a number that has grown over the last two years. America’s federal debt explosion continues unabated. In Jan. 2009, the national debt was $10.626 trillion. Today, America’s national debt stands at over $17,300,000,000,000.